2015 Spring Snow Goose Hunting Tip#1 – Today we’ll talk about decoys. Decoys, Decoys, Decoys. I receive more questions about decoys than any other topic when it comes to spring snows, and for good reason, it is critical to the hunt. Decoy questions usually revolve around the following topics and by following the advice in each one, you will be well on your way to curing that spring snow goose fever. Why did I put this first on the list? Because you really need to have good numbers of decoys to consistently pile up the geese. You can search your favorite forum and find stories of hunters killing big numbers of geese over 50 decoys (I have done it myself), but this is the exception. I would not be being honest if I said big numbers of decoys don’t help you kill more birds. Big spreads simply attract more, and the more you attract, the more you will decoy! Aim to get a minimum of 300 decoys and build up to a larger spread. If you cannot afford or do not have the time to set out 300, try to team up with another hunter. Spring Snows is a team sport. I have been fortunate to hunt over some massive spreads and have found anything over 1500 does not seem to make much difference. They both will pile up the geese, but they each have their pros and cons. Full body/ staked shell decoys simply finish geese better. On any given day I have found full bodies finish geese an extra 15 yards closer than a supported windsock decoy. They also look great on no wind days. But they have a huge downfall in that they take much longer to put out each morning, cost a good amount, and take up significant space in a trailer when hauling 300 plus decoys. If you are going to go the full body route, my suggestion is to buy used on craigslist, screw or glue all heads if buying a two piece decoy, and buy stakes for your decoys. By storing your full bodies with the ring bases removed in the trailer, it keeps them cleaner and you can fit more in the trailer without muddy ring bases taking up room and getting your decoys all muddy. 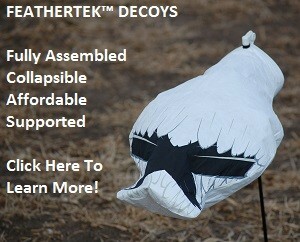 I currently run 1500 supported and collapsible FeatherTek Windsock decoys. They collapse into 6 large tubs, are quick to set out, look great on windy days, and with the supported backbone design hold shape on no wind days. Do they look as good as a full body on no wind days, nope…but the premium windsocks of today are light years better than the old dead rags on no wind days plus you can pack and store a spread 10X bigger than a full body spread. Why did I switch from full bodies? My style of hunting changed because of hunting pressure and starting a family. I no longer had the luxury to hunt snows every weekend for two months. My time to hunt was more limited and the popularity of the sport made it harder and harder to get on the “X” because of more hunting pressure. I found setting up in high profile fields in known migration areas with a large spread of socks most effective. I always run 20-30% blues in my spread. This matches Mother Nature and if you are thrown a curve ball with a snow storm during your hunt, you have enough blue decoys to make your spread still pop against a complete white background. Running a full body spread. Check…you have this one covered. Running a supported windsock spread? I run 20% headed decoys and keep them close to where I expect the geese to finish. This added bit of realism helps finish those geese when hunting those early migrating adults. By using the tips above I know you will kill more snow geese this year! 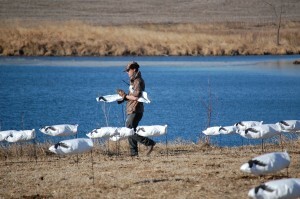 Check out a full selection of snow goose decoys here.